You are currently browsing the archives for the Silence Dogood category. Is Michael Freer above the law? Last Thursday, Michael Freer, the Chief Human Resources Director for St. Cloud State, sent out an email to the campus community indicating the vice presidents and president recommended not allowing alternate summer schedules for staff. This decision certainly has generated a lot of talk on campus and perhaps deflected some of the focus away from the enormous shortfall in the FY’19 budget and the solutions that will be necessary to solve the deficit. Mary Divine states in the article that the Forest Lake City Council deadlocked on a motion 2-2 to remove him from office last October (Freer abstained). Since November of 2016, Freer has been the Chief Human Resources Officer for Saint Cloud State University. Divine also stated in the article that Freer’s attorney said at the time that “he was seeking housing in Forest Lake.” Apparently, this wasn’t true! Apparently, while living in Maple Grove since at least June 2017, and working at SCSU since November of 2016, Freer served on the Forest Lake City Council until his resignation in March of this year. Who at St. Cloud State University hired Michael Freer? When did they find out about his issues with potentially violating city codes and state law? Are they at all concerned about the appearance a significant ethical lapse in judgement? What did they do after they found out? Considering that Interim President Vaidya has been a lame duck since accepting the Presidency at Northern Kentucky University on November 9th, 2017, don’t expect any answers. More likely, Interim President Vaidya will be treading water and using his vacation days prior to officially starting his new job on July 1st, 2018. 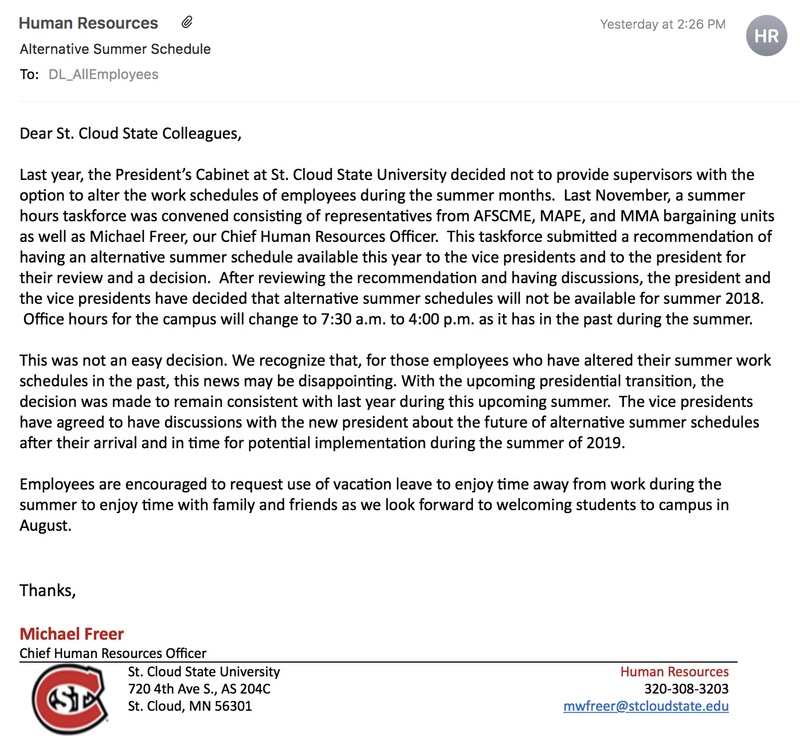 Last Thursday, the HR director sent out an email to the campus community indicating the vice presidents and president recommended not allowing alternate summer schedules for staff. 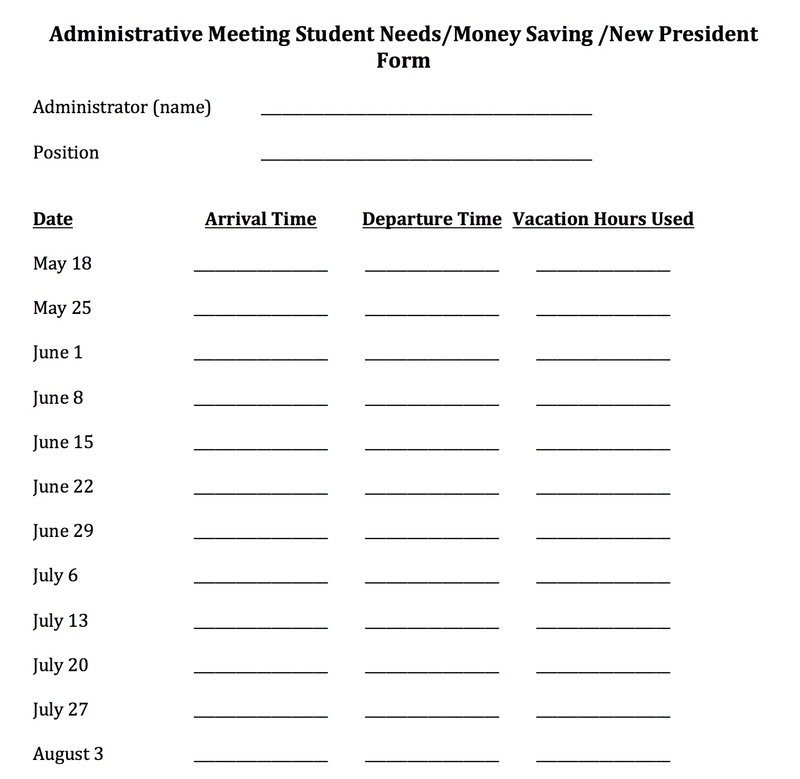 Since all of Saint Cloud State’s administrators are state employees, what about having each administrator voluntarily report their hours on campus for each of the Fridays during the summer? The expectation, of course, is that they should be available on campus for eight hours each Friday. Where appropriate, they could indicate that they used vacation time to allow them to be off campus. Just to be helpful, they could use the form reproduced below. In this way, the campus community could see that the campus is appropriately staffed on Fridays with senior administration leaders and it would also provide a higher level of accountability. Clearly, if the clerical staff need to be on campus on Fridays, it seems only logical that members of the senior administration would be willing to do so as well. Remember leaders lead! Another Slap in the Face of the University! The first person someone meets when they come to the St. Cloud State University campus is usually one of the clerical staff—they are the public face of the University. In case you didn’t already know, summers are short and precious in Minnesota. For many years, staff—with approval of their supervisors—were allowed to work four ten-hour days per week (with Fridays off) instead of the usual five day a week eight-hour workday. 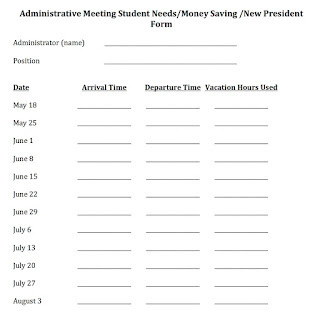 Three years ago, President Potter decided that in order to save money, revised summer hours would no longer be allowed. When it was pointed out that this did not in fact save any money (working forty hours per week whether in four ten-hour days or five eight-hour days is still the same number of hours), he tried to recover and cited that it was to be able to “serve student needs.” This might be a noble sentiment. However, this also is a joke because the campus is almost a ghost town on Fridays in the summer. Schedule EMS (campus planner) lists 749 entrees between 5/14/2018 and 8/2/2018. Only 75, which is almost exactly 10% have a class meeting scheduled on Fridays. If you search on the Summer School link for all classes, the first 250 summer classes are displayed. Of those, only 30 have a class meeting time on Friday and, of those, 7 are graduate courses that meet class on Friday and Saturday. Several university staff quit/retired over the original decision. The next year, the administration reversed their decision and allowed staff, again with approval of their supervisors, to work four ten-hour days. Life was good again. The following year (i.e., last year), the administration changed their mind and university staff were again required to work five eight-hour days per week. The staff were told that they could use vacation days if they didn’t want to work on Fridays. So, the idea that it was to serve student needs was nonsense. Additionally, if staff use vacation days to take Fridays off, they still get paid—so there are no cost savings! Thursday, the following email was sent to the campus community. The summer hours taskforce recommendation on summer hours was ignored and the result of this process resulted in the same outcome. Staff would no longer—with permission of their supervisor—be allowed to work four ten hour days. The reason given now: “With the upcoming presidential transition, the decision was made to remain consistent with last year during this upcoming summer.” Can I say that this is nonsense? The VP’s and Interim President knew for a year that a presidential search was occurring and that a transition to new leadership would be occurring during the summer of 2018 so why blame that fact for a bad decision? Why delay this decision and not other decisions? Just to be consistent, for only two of the last 36 years, staff have not been allowed to work the alternate summer schedules—again with approval of their supervisors. So, to be consistent, staff should be allowed to decide (in consultation and approval of their supervisors). This decision has increased the lack of morale on campus. Proof again the decisions made at the top who cares how it affects the employees below. This is another beat down and if they have run out of hammers maybe facilities will borrow them some so they can continue to keep us down. I am very disappointed that our administration once again has ignored the recommendations of our community and has shown us all that we are not valued as employees or people. This is the second time this month that I have felt like the people who provide the critical foundation for this campus to operate have been disrespected. Yet another slap in the face by this administration. I couldn’t have said it better myself. None of the administration has come to the defense of this policy. Perhaps because there is no defense and perhaps that is why the top Huskies have not taken individual responsibility. The top ‘dogs’ must not feel they are unleashed to do amazing things and they collectively blame a process and a new person for their actions, which is consistent with their past efforts to avoid being held accountable. Clearly, morale has been low at SCSU. 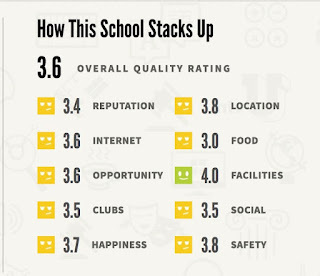 It you are not certain, just look at the results of the Great Place to Work Survey. Moral has just gotten even lower for those people that are the first ones to greet visitors to the campus. Makes sense to me. Two female students in the class wore “Pink” monogramed shirts. So, “Pink” branded shirts out-performed the home school brand. What does this mean? With such a small sample it’s hard to reach a definitive conclusion. However, a simple walk around on campus (unless it is a day when they are recruiting students), you might get the idea that what was true in one class on one day was true in general. Maybe the cost of SCSU branded apparel is much more expensive than that from other schools so fewer people can afford them. Perhaps there was a YouTube challenge on Thursday to not wear your school colors to class. Many explanations are possible. However, these two explanations are probably less likely than the fact that SCSU has an image problem that rebranding and giving away free tee shirts won’t solve. If there is a solution for an apparent lack of Husky Pride or for increasing the value of the brand, it’s seems to be a closely guarded secret. What I do know is that ‘unleashing’ a tired old dog won’t make that dog fetch. 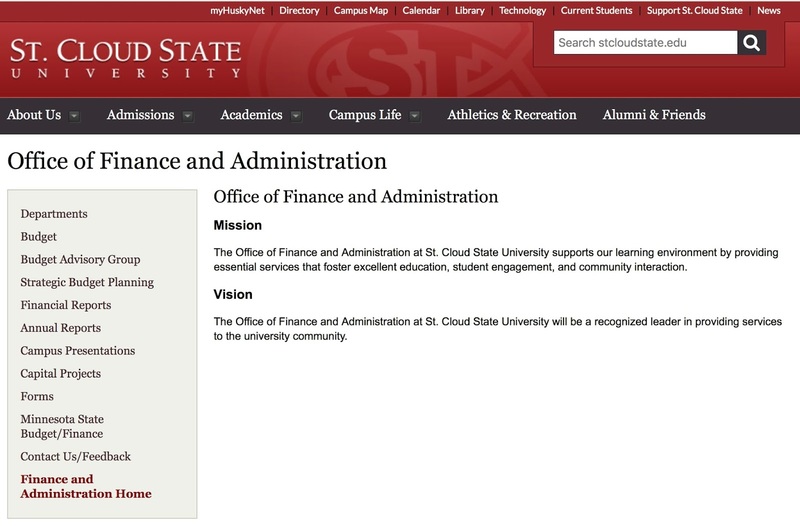 Will an increase in Husky Pride solve SCSU’s enrollment and financial problems? Perhaps, but doing the same old things over and over and expecting a different outcome is nothing to be proud of nor will it solve any problems. It seems that something new is needed or a lot of SCSU branded merchandise will be found on the discount rack or at yard sales. 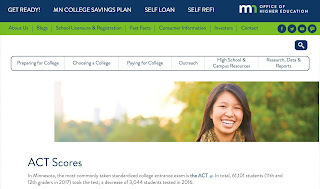 While many people will argue that the RATE MY PROFESSORS website has some shortcomings, one will have a little more difficulty arguing with the Minnesota Office of Higher Education. 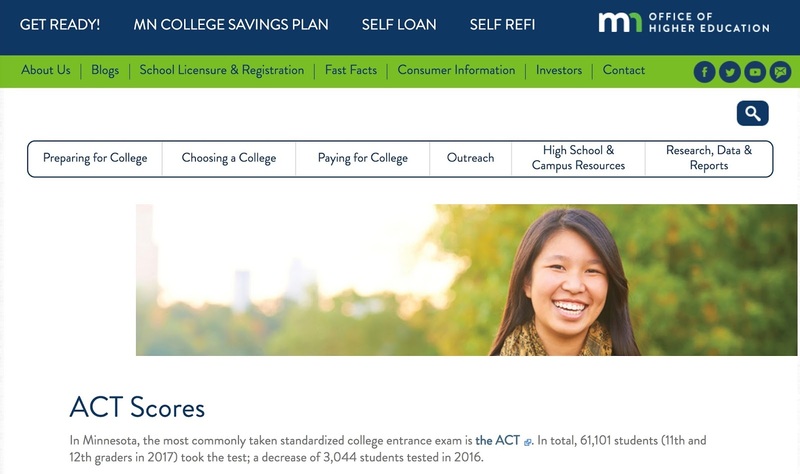 you will find the MN Office of Higher Education’s information about ACT scores. 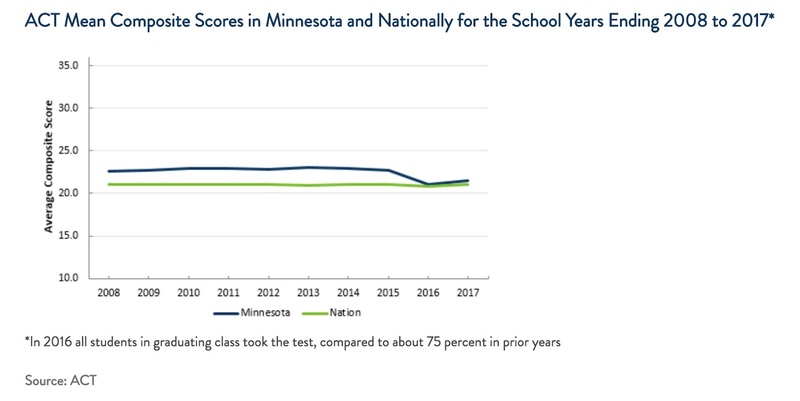 One of the first figures that caught my eye was a plot of the composite ACT scores for Minnesota compared with the rest of the nation. The scoring advantage Minnesota had in the past dropped to only a difference of 0.2 in 2016 and the difference increased slightly to 0.5 in 2017. Based on these results, Minnesota might have some difficulty continuing to sell itself as the “brainpower state” and contrary to Garrison Keillor’s assertion—everybody isn’t above average! 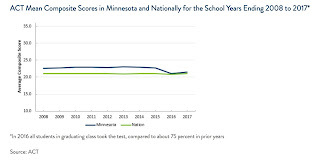 A second figure that stands out is the ACT scores of First-time Degree-seeking Students Admitted to Minnesota 4-Year Colleges, 2016-2017. Looking at the data, students self-select the schools that they wish to send their ACT scores. 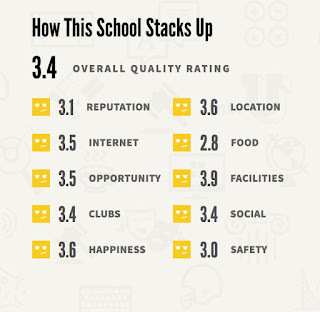 This can be interpreted as a measure of the academic reputation of a school. The first column indicates the Number of students submitting ACT scores to a particular public 4-year institution. 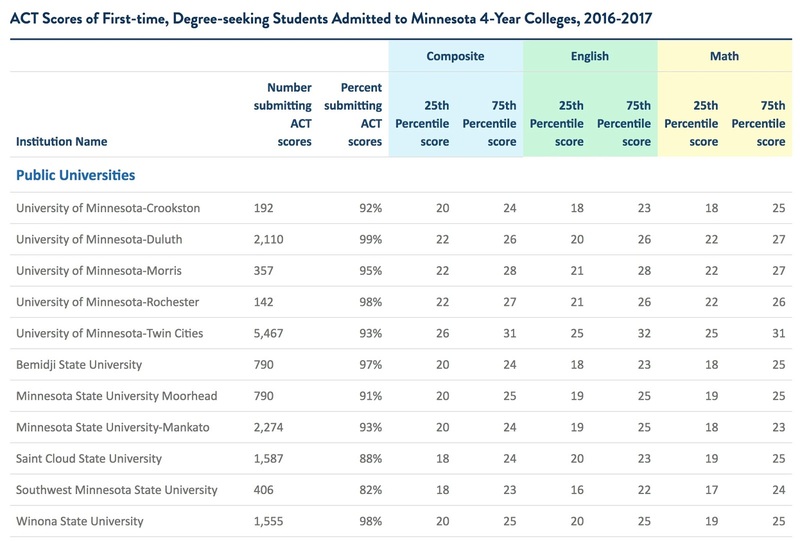 From this data, it is clear to see that the University of Minnesota—Twin Cities is the big winner with more than twice the number of students submitting their scores than any other public university. From there, Minnesota State University—Mankato is second with 2,274, University of Minnesota—Duluth is third with 2,110, followed by Saint Cloud State University in fourth with 1,587. 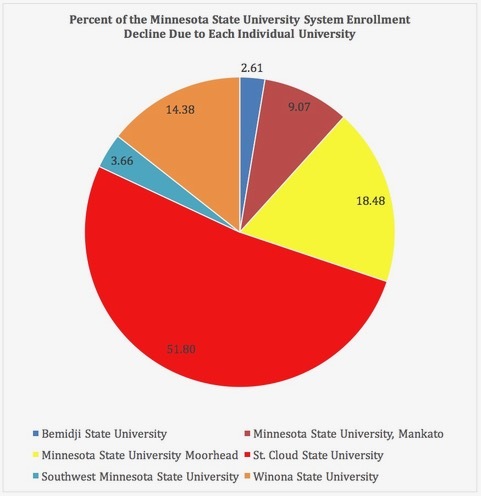 From the data, 687 more students in Minnesota chose to send their ACT scores to Minnesota State University—Mankato than Saint Cloud State University! In fact, Saint Cloud State University only had 32 students report their ACT scores than Winona State University. The second column of data in the table indicates the Percent of students submitting ACT scores to a particular public 4-year institution. To make it easier to understand the data, I have created a table listing the percent by rank order rather than alphabetically with ties broken by the university with the larger number of students. 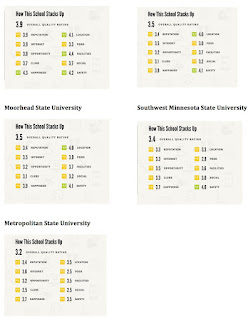 In the table, the universities in the Minnesota State system are in bold because the comparison within the Minnesota State system is important to those universities. Clearly, Southwest Minnesota State University brings up the rear at 82%. However, Saint Cloud State University, coming in second from the bottom, at 88% should be a shocker! Winona State University and Bemidji State University lead the Minnesota State system universities with 98% and 97%, respectively. Minnesota State University—Mankato, which has been Saint Cloud State’s traditional rival, comes in at 93% which is 5% higher. Even Minnesota State University—Moorhead beats Saint Cloud State University 91% to 88%! At some point, when there has been so much ‘smoke’ at Saint Cloud State University, it is hard to believe that the Fire Department has not been called! Considering that Saint Cloud State University ‘invested’ nearly half a million dollars back in 2011 in rebranding: “Think, Do, Make a Difference”, the results show that Saint Cloud State University did not get its money’s worth! The last data to consider is the third column in the table showing the 25th Percentile score of the ACT composite. Essentially, this indicates that 25% of all applicants have ACT composite scores lower than this score. Again, to make it easier to understand the data, I have created a table listing the percent by rank order rather than alphabetically with ties broken by the university with the larger number of students. Again, the Universities within the Minnesota State System are shown in bold. Clearly, the universities within the University of Minnesota System attract higher quality students than the Minnesota State System. 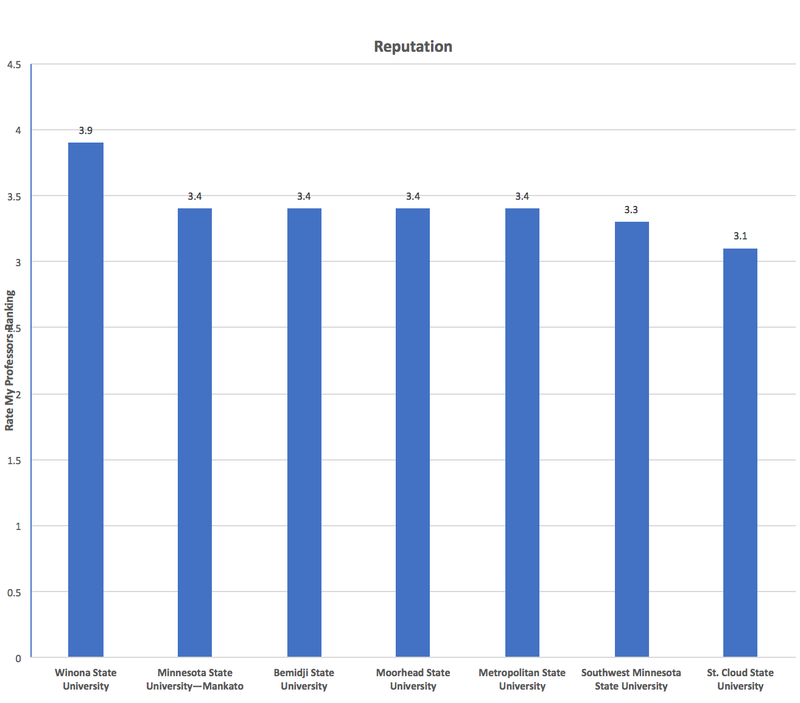 However, within the Minnesota State System, Saint Cloud State attracts the least qualified students (in a tie with the smallest university within the Minnesota State System). In the past, numerous arguments have been given for Saint Cloud State University’s decline from being the ‘flagship’ school within the system to second or third place [It is interesting to note that Winona State University had more new entering freshmen last fall than Saint Cloud State University]. Demographics, the recession, the improving economy, “right sizing”, the list goes on. 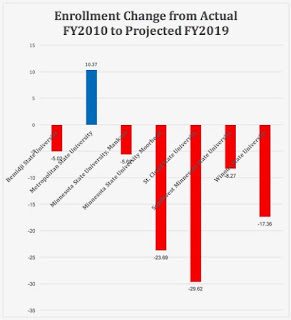 The only thing that has not happened is that no one has been held accountable for the 30% decline in enrollment, multimillion dollar deficits year after year and morale, which can only be described as being in the toilet (indicated in the Great Place to Work survey in 2013). With ongoing searches for a new President and Chief Financial Officer, it is a wonder if qualified candidates will apply (or stay) if they know of Saint Cloud State University’s downward trajectory. More importantly, one wonders if anyone will ever be held accountable at SCSU. I can’t say that I recommend the RATE MY PROFESSORS website. A lot of the time, I think it is just an outlet for frustrated students to vent their frustration. Truthfully, until last Wednesday, I had never looked at the website. But I was curious and just for fun decided to take a look to see what I might find. I looked first at St. Cloud State University. 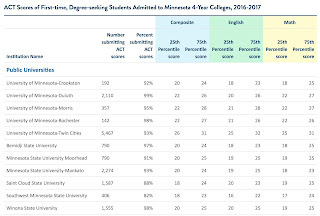 Not really understanding what a 3.4 might mean, for comparison I looked at Minnesota State University—Mankato rankings, the university most similar to SCSU in the Minnesota State System. 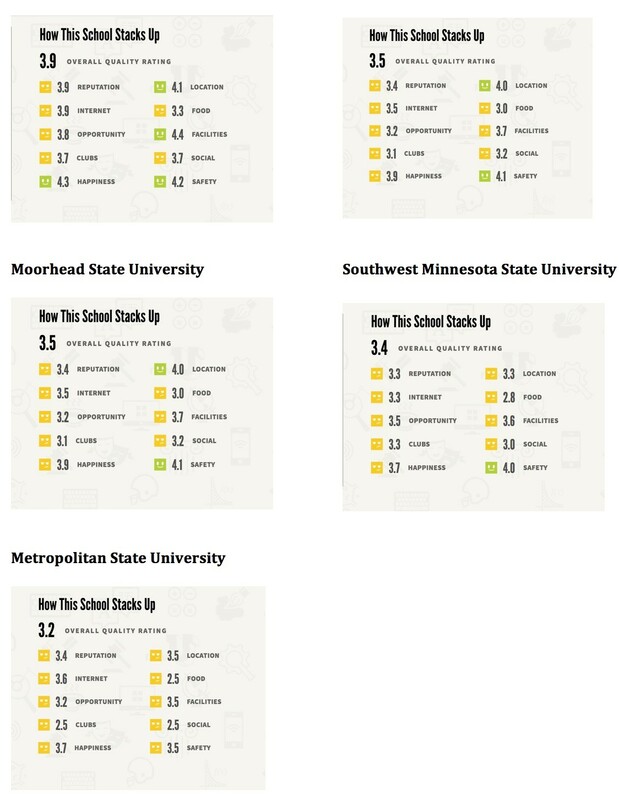 Based on these overall rankings, which are not scientifically valid, SCSU comes out ahead of only Metropolitan State University in the overall quality rating! For each and every measure, SCSU trails MSU—Mankato. Most significantly, in the safety ranking 3.0 vs. 3.8. 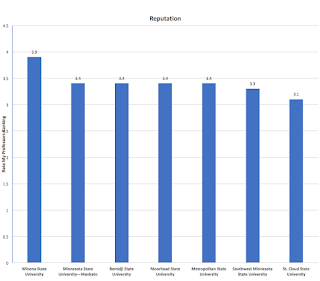 But for the reputation measure, I was a bit miffed at SCSU’s reputation ranking of 3.1 vs. MSU—Mankato’s 3.4. Next, I decided to look at the rest of the universities in the Minnesota State System. These rankings may be anecdotal and have some validity issues. However, students use them. And they use them a lot! For many years, administrators have said that SCSU hasn’t done a good job ‘telling its story.’ And in the past that may have been true. However, many of these same administrators and their replacements have been saying this for so long that it is hard to believe that they haven’t been held accountable for not doing a better job of telling SCSU’s story. Unless of course you believe that just saying that ‘they’ haven’t done a good job telling the story is explanation enough. It almost seems this explanation is good enough for the titanic enrollment drop since FY10. With no end in sight for the enrollment drop, it might be reasonable to ask is anyone ever held accountable at SCSU? Where is St. Cloud State’s CFO? Does St. 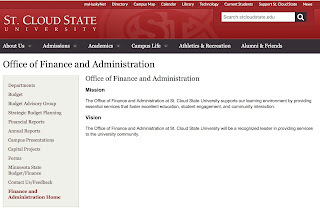 Cloud State University Have A CFO? If you wanted to inquire about the financial health of St. 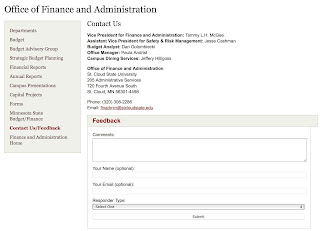 Cloud State University, you might expect to go to the website for the Office of Finance and Administration and mine the site for current information. On February 18, 2018, I performed this search. 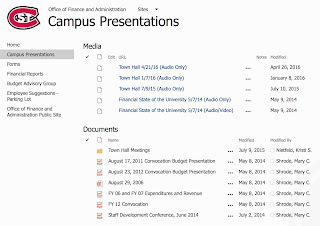 The Vision Statement clearly states: “The Office of Finance and Administration at St. Cloud State University will be a recognized leader in providing services to the university community.” I’ll come back to this Vision Statement later. 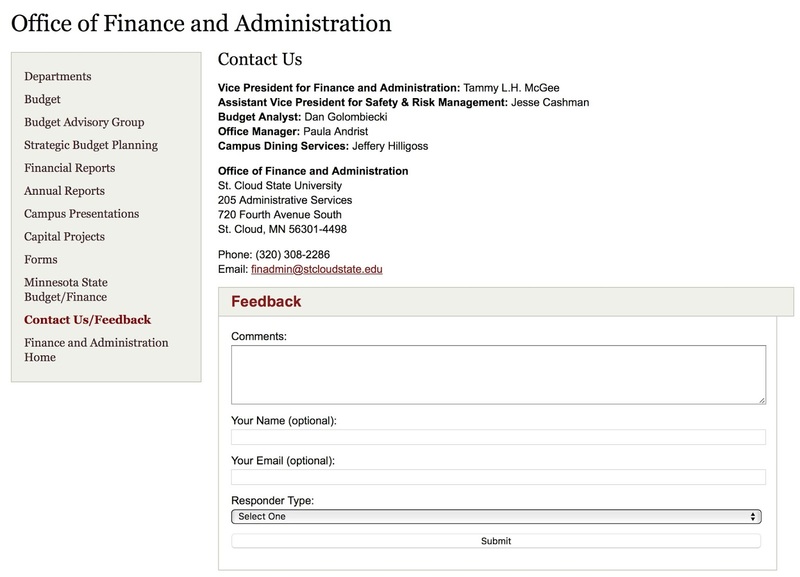 So if you wanted to try to contact the Vice President for Finance and Administration, you’re out of luck. But this is really not new news. Tammy L. H. McGee WAS the Vice President for Finance and Administration until she quit/retired as of November 13, 2017. Apparently, the website simply has not been updated in almost five months to reflect her departure. If you wanted to see an annual report from FY 2002 to FY 2014, just click on the link and voila! Unfortunately, this is FY2018, which you might not expect to find, but the annual reports for FY 2015, FY 2016 and FY 2017 are missing. 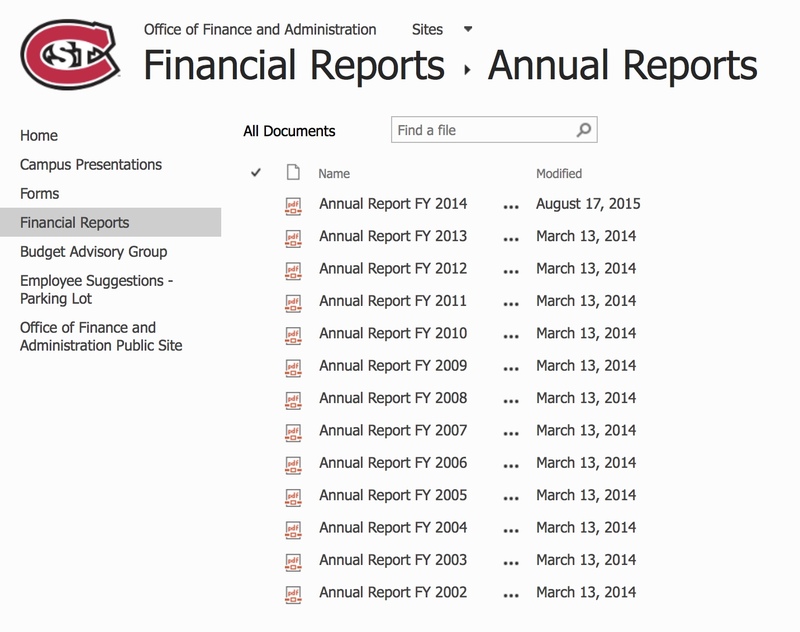 While it is true that you can find SCSU’s annual reports on the Minnesota State website, they should be available here. If nothing else, simply put in a link to the Minnesota State website. There is no information listed for FY18. The last information in the FY17 folder is for the April 27, 2017 meeting. 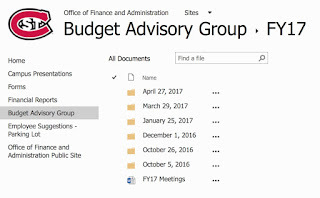 The Budget Advisory Group was a committee with the Vice President for Finance and Administration and a faculty member from the Faculty Budget Committee serving as co-Chairs. 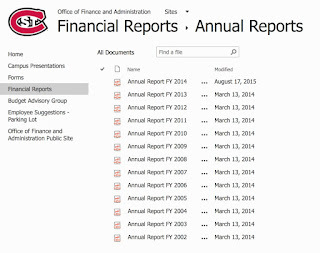 It seems that the university is no longer willing to share financial data, especially because much of the data shows SCSU’s precarious financial situation. This is April of 2018, it’s hard to believe that no new media has become available for two years and any new documents have become available for almost three years! If you were aspiring to being “open and transparent” organization, this would hardly be the path that any organization would take. 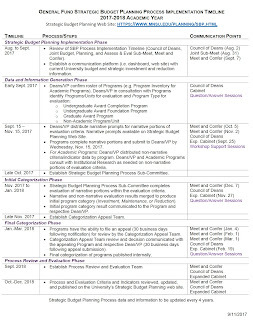 After looking at their website, if you were to rate the fulfillment of the Office of Finance and Administration Vision Statement to be: “a recognized leader in providing services to the university community,” you would probably have to give the university an F.
It is interesting to note that since my email is being read by the administration (and this article was originally written back in February but not published until now), they have since removed Tammy McGee from being listed as the Vice President for Finance and Administration and now list the position as “vacant.” It’s nice to see that things change, albeit slowly. Unfortunately, the underlying issues and the lack of openness have created a level of distrust on campus that is almost palpable. 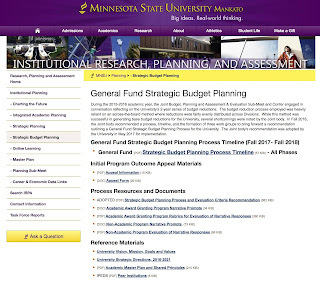 Is There Difference in Strategic Planning at MSU—Mankato and SCSU? On March 28th, the academic deans at St. 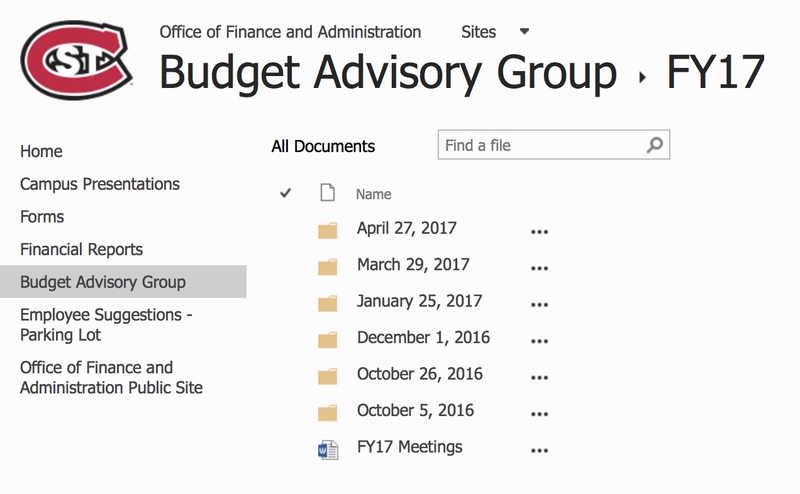 Cloud State announced to their department chairs that they had until April 20th to finish a complete program review process that would be used to make budget reductions for FY’19, which begins on July 1st. Since SCSU has had declining enrollments since FY’10 and multimillion dollar deficits year after year, it is hard to understand the urgency of this process. That may sound crazy but at President Vaidya’s open forum on February 28th, he spent more time talking about SCSU’s successful athletic teams and initiatives than the budget situation. It’s hard to believe but true, as evidenced by listening to the presentation! This past Friday, April 6th—two weeks before the department reviews were even to be completed—key academic deans met with the provost to review their own draft decisions about programs that should be “built,” “maintained,” or “phased out.” This was done without consideration to the rushed review process, which had not even been completed, which makes the program review process appear meaningless. Having these reviews due the Friday before the last week of classes will certainly not allow for any appeal of the decisions that are made because the review by the administration will not be complete until the students and faculty have departed campus for the summer. True leaders are willing to explain and justify their decisions. Interim SCSU President Ashish Vaidya will be departing campus on June 30th to assume the presidency at Northern Kentucky. It’s hard to believe that he will ever have to explain or justify to the faculty, staff and students the decisions he has made. 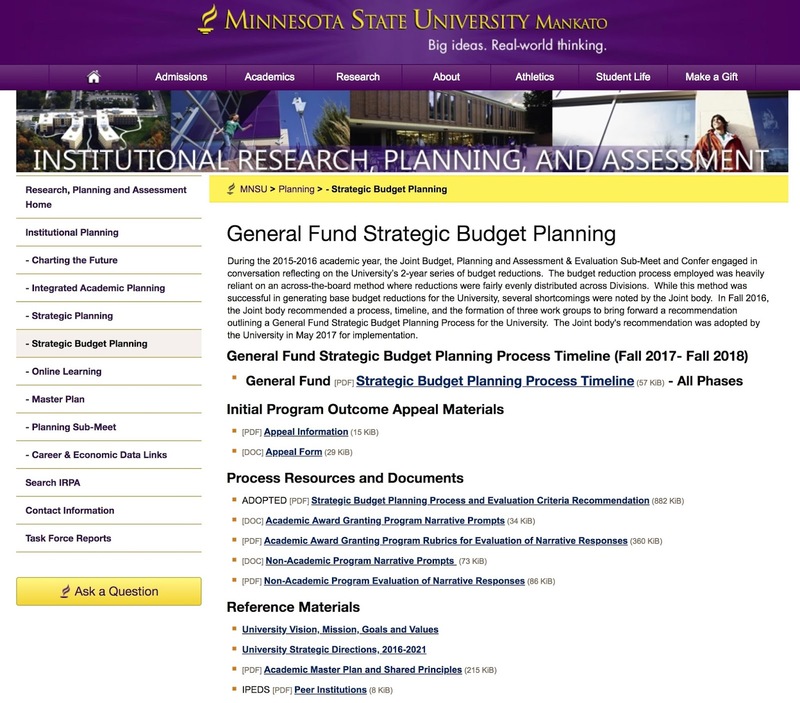 Compare this with the process MSU—Mankato is using to perform the same task. 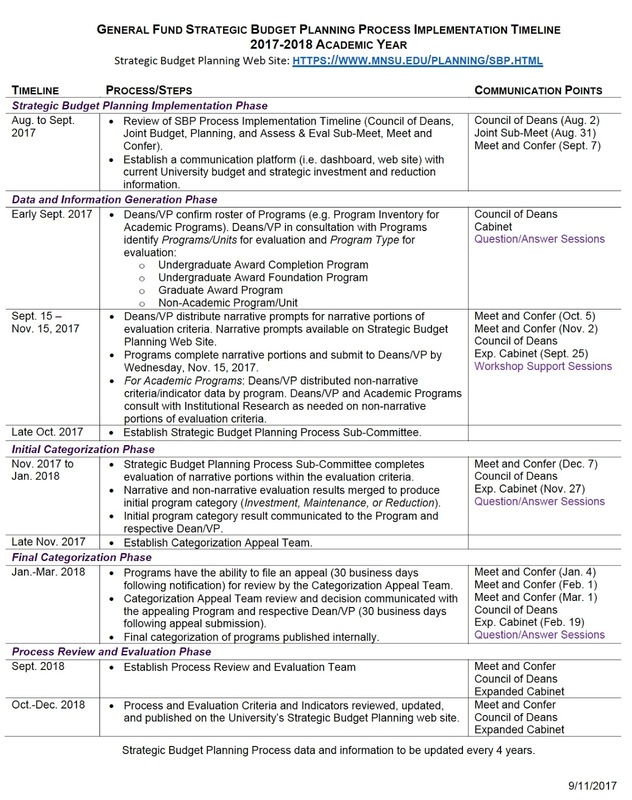 Not only did MSU—Mankato start earlier (last August, not in the last month of the semester), their process is actually open and transparent. This fact is glaringly obvious simply by looking at MSU—Mankato’s Institutional Research, Planning, and Assessment website. 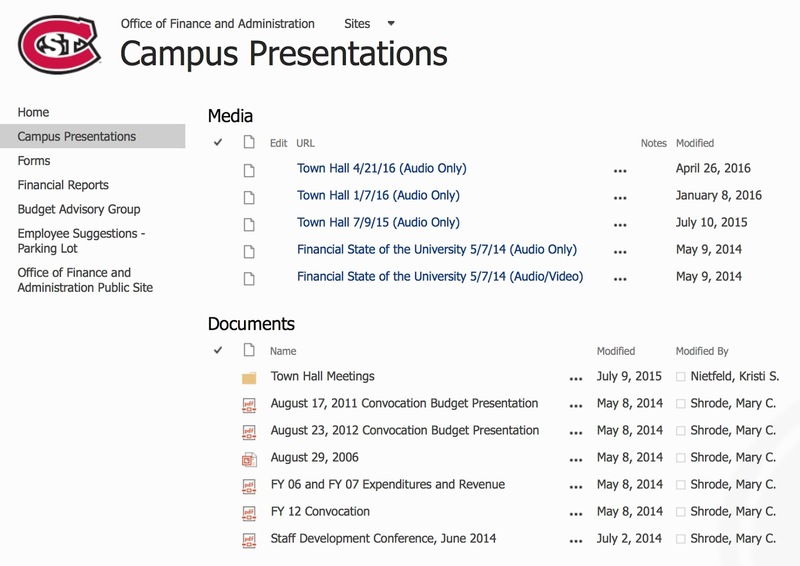 No similar information about the process being used for evaluation is available for SCSU. And what information that is available seems to be only available on private (closed) servers. So much for being open and transparent. 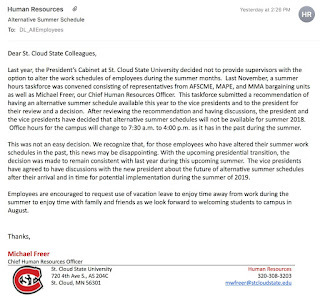 A historian might look back at this and simply see a series of excuses that try to say “it’s not my fault.” However, if you dig deeper, it is very clear that SCSU has been embarrassingly slow to respond to the decline and has been completely reactive rather than proactive. It is important to recognize that neither President Potter, President Vaidya, or Provost Malhotra were willing to establish an enrollment target for the university. Thus, “right sizing” the university was just a fantasy or delusion. Secondly, they never established priorities of academic programs or student services. This has resulted in every unit merely fighting to live no matter what the cost is to neighboring programs. Without such guidance, it appears more like gladiator combat or dog fighting, with the ‘best’ gladiator (or dog) surviving to live to fight another day. While there are certainly many issues that have led SCSU to the place it finds itself in, one of the more significant is that the senior administration at SCSU is almost entirely made up of ‘interim’ appointments. Although some of these individuals may be quality people, the pressure of being an interim, that perhaps wants to be appointed permanently, almost certainly means that significant decisions are put off for the permanent person to make. 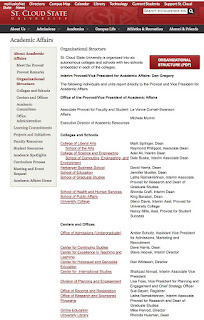 At SCSU, the President is an interim, the Provost is an interim, two academic deans are interims, one associate dean is an interim, the Associate Provost for Research and the Dean of the School of Graduate Studies is an interim, the Dean of the University College is an interim, the Director of the Center for Excellence and Teaching and Learning is an interim, and the Associate Vice President for International Studies is an interim. Such a large number of interims at a university is a clear sign that there is something wrong. 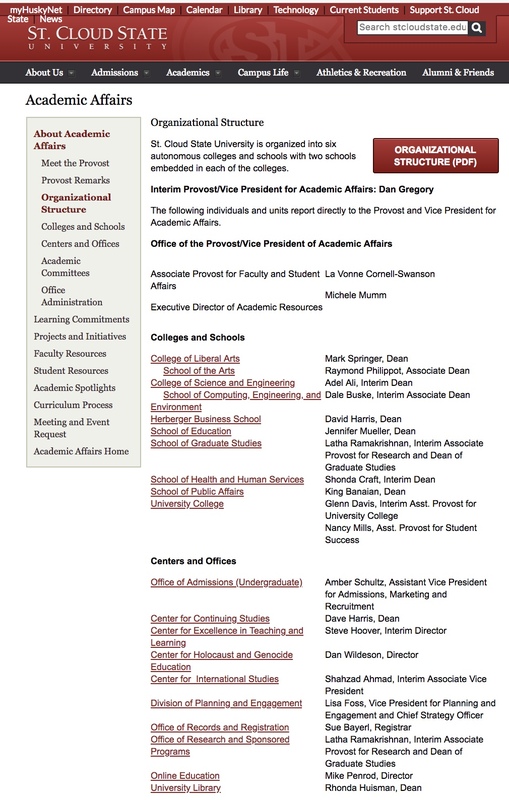 The following figure shows the organizational structure from the website for the Academic Affairs Office. Perhaps even worse than having a large number of interims is that since June of 2012 there have been five Chief Financial Officers (Steve Ludwig, Len Sippel, Doug Vinzant, Rick Duffet, and Tammy McGee). Tammy McGee resigned in November of 2017. It may be hard to believe for an organization with an annual budget over $200,000,000 but an interim has yet to be named! Also, last spring the Chief Information Officer was ‘promoted’ (some said President Trump’s favorite phase on his reality TV show) to a position in the Minnesota State central office. 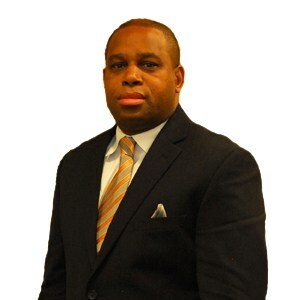 Since that time, Information Technology Services, which has a staff of forty-six, does not have an interim CIO although it appears that the Deputy Chief Information Officer is carrying out those duties. 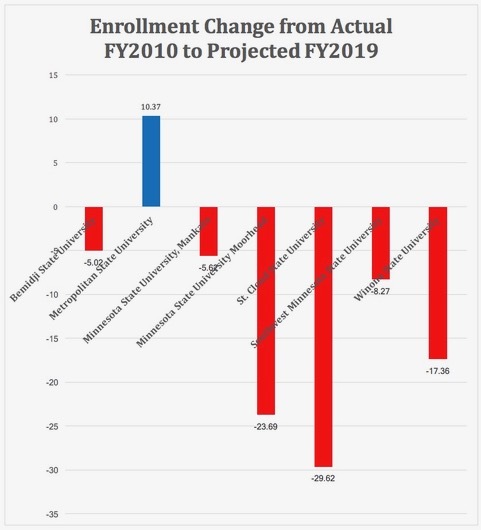 It’s hard to believe that whatever results come out of the current program analysis that they are going to solve the enrollment decline and resulting budget issues any time soon. So, expect the enrollment decline to continue at SCSU and retrenchment and closings of programs to follow. There are simply too many balls up in the air and the crash is inevitable. In a document provided by SCSU entitled St. 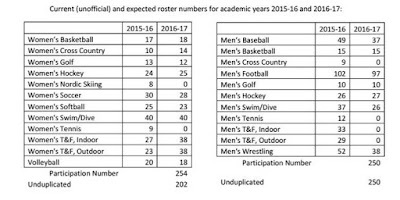 Cloud State Intercollegiate Athletics Frequently Asked Questions, there is the following table showing roster participants. So in the 2016-17 academic year, it appears that there will be 254 women participants and 250 men participants. Nothing here shows unequal opportunities under Title IX. However, if you total up the numbers for 2015-16, you find that the women had 246 participants and the men had 374. As a result, in 2015-16, the men had 128 more participants than the women! I may have been born at night—it just wasn’t last night! If there are 128 more men participants in intercollegiate sports than women, it certainly seems like this might be a violation of Title IX equal opportunity provisions. I guess that with such a large disparity between men’s and women’s participants in 2015-16, it was probably wise for the administration not to show the numbers totaled! The lawsuit alleges that the university, for years, has offered more athletic opportunities for men than for women. Clearly, based on the 2015-16 academic year from the data provided by SCSU, the students have a strong case. Looking back at the participation numbers for previous years should be pretty easy to do. If the numbers for the prior years are similar to those for 2015-16, I’m fairly certain that SCSU will not issue a press release. So in this case, no press release means there were more opportunities for men than women, essentially proving the student’s case. If a press release comes out with the numbers showing equal access, the students probably don’t stand a chance in court. So President Potter may have been hinting that some of reductions in sports programs are due to Title IX considerations. I guess that is a whole lot better than saying for the nine years I’ve been President; we’ve been out of compliance with Title IX so these cuts are necessary to bring us into compliance. Instead, he used the urgency of a 10 million dollar budget deficit to justify cutting six sports programs—just so he wouldn’t have to explain why for years SCSU has been out of compliance with Title IX. Some analysis of the proposed reductions in sports programs do not indicate that there will be a $250,000 savings as claimed by the administration. In fact, it has been argued that the reductions will actually cost the university more that what it claims it will save. The one thing for certain is that the administration’s handling of the elimination of the sports programs has given St. Cloud State another ‘black eye’ and the publicity from the lawsuit brings up the $8.7 million dollar loss on Coborn’s Plaza Apartments (over six years), a 24.8% decline in on campus students (since 2009-10), and the $10 million dollar budget deficit for FY17, all of which does not does not address any of the solutions to these complex problems. So what does this all have to do with the Easter Bunny? Not a lot. However, if you believe in an egg laying long-eared, cotton-tailed creature, maybe you just might believe that the cuts in the sports programs at SCSU were part of solving the $10 million dollar budget deficit and not a clever way to bring SCSU into Title IX compliance without drawing attention to the fact it was so far out of compliance. Cutting $250,000 from the athletic department budget solves only 2.5% of the $10,000,000, as President Potter refers to it, “budget hole to close.” Obviously, more work needs to be done to end up with a budget that doesn’t result in a deficit—since there are no longer any mandated reserves to spend down. Now if someone could only explain why the Easter Bunny’s eggs are made out of chocolate we might be able to solve one of the few last remaining mysteries.